Be the first to share your favorite memory, photo or story of Troyselle. This memorial page is dedicated for family, friends and future generations to celebrate the life of their loved one. 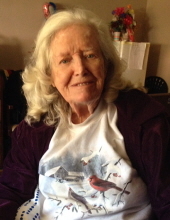 Troyselle M. “Kitty” Falkenrath, of Desoto, MO, formerly of Rolla, passed away Sunday, March 31, 2019 at the age of 92. She was born in Palmer, TX on October 2, 1926 to the late Troy William Murphey and Forrest Rebecca (Clark) Murphey. Kitty was first married to Raymond Mills who preceded her in death. On April 2, 2002 she married Frank E. Falkenrath who preceded her in death on March 3, 2016. Among her interests, Kitty enjoyed cooking, sewing, and music. In addition to her parents and husbands, she was preceded in death by one sister, Betty. Mrs. Falkenrath is survived by two children, Maxie Mills, of Washington, and Marcia Mickles, of Mississippi; three grandchildren; several great grandchildren; other extended family members and dear friends. A graveside service for Troyselle Falkenrath will be held at 10 am Thursday, April 4, 2019 at the Pea Ridge Cemetery in Doolittle, MO. To send flowers or a remembrance gift to the family of Troyselle N. Falkenrath, please visit our Tribute Store. "Email Address" would like to share the life celebration of Troyselle N. Falkenrath. Click on the "link" to go to share a favorite memory or leave a condolence message for the family.